Lavera Very Sweet Body Milk with Organic Almond Milk and Organic Honey is a care of infinite sweetness that provides hydration and protection to the skin. Rich in organic honey soothing, it helps healing and nourishes the skin deeply. Ideal for irritated areas of the body that want softness. The organic almond it contains helps maintain hydration of the skin and allows better penetration of assets. Thanks to its melting texture, this milk penetrates your skin instantly. Its fragrance with sweet notes is also a real olfactory treat! 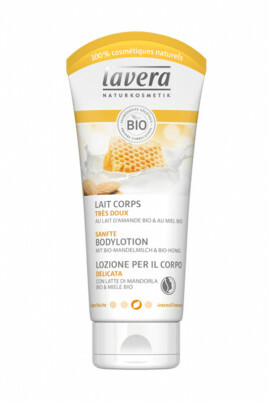 Lavera Body Milk with Organic Almond Milk and Organic Honey is perfect for normal to dry skin! Lavera Body Milk for a soft and smooth skin! On a daily basis, apply this organic honey milk throughout your body, emphasizing dry or irritated areas. You can also apply it as soon as you feel the need. Natural ingredients for hydration of normal to dry skin!